They say the housefly is nature’s cat toy, and it’s true: an occasional fly can provide a cat with food and entertainment for minutes on end. But a dozen flies inside the house, all at the same time, is just too much of a good thing — I know, because that’s what I woke up to last Sunday morning. It was just like Lord of the Flies, or what Lord of the Flies would have been like if it had been about actual flies instead of schoolboys and had taken place in a house instead of on an island, and if the characters, instead of turning feral, had basically just hung out in windows all day. Or maybe it was more like what Lord of the Rings would have been like if the Hobbits had been flies who, lacking fingers, were unfamiliar with the concept of wearing a ring and had spent the entire time hanging around in the Shire, which is well known in some academic circles to be an allegory for my house. My initial reaction was horror that there were so many flies in my house. But then I noticed that they were all sitting on my windows — clearly, all they wanted was to go outside, which was exactly what I wanted them to do. For the first day, the flies and I worked together, united towards a common goal, and I was able to usher about half of them out through doors and windows. But the others stayed. My relationship with the remaining flies began to sour. They seemed less interested in escape than in hanging out in the sun. And, while I was initially relieved that they showed no interest in my food, the cats’ food, or the garbage, I began to see their disinterest as an insult. I bought a flyswatter and some sticky traps. I never actually managed to bring myself to use the flyswatter (not out of any sense of compassion; I just didn’t want to have to deal with squashed fly remains), but the traps got some of the flies, and my cats got the rest. I’ve told a few people about the flies, and they’ve all responded the same way: by exclaiming “Oh! There must be a dead animal in your house!” in a cheerful tone of voice. When these conversations have taken place at my house, they’ve generally followed up with “but I don’t smell a dead animal”, which is probably the highest compliment anyone has ever paid to my housekeeping skills. No, no — if you’d done that, I wouldn’t have wanted to get fly guts all over my lovely fly swatter. (I don’t want to get fly guts all over the lovely stockings either, of course, but that’s less likely to happen as a result of normal use). Maybe your house is just the neighborhood flop house for flies. You know, where all the cool flies like to hang out. It might be a blessing, really. Or perhaps a sign that something untoward is about to happen. My house has previously been home to termites, ants, and wasps. I’m just hoping it will eventually run out of insect species. Hmmm… actually, I haven’t seen any flies today. Maybe the Rapture came, and only the flies were worthy. First the bees, now the plague of flies … Your blog is very close to becoming the story of Passover. Now that you mention it, I’ve also had frogs. Well, a frog. And technically it was a lizard, or maybe two half-lizards, depending on how you count these things. I found a lizard’s tail on the carpet in the middle of the room one day; the resulting search found no additional lizard parts. And then the next evening, I noticed my cats staring intently at a spot in a closet, where I found a tailless but otherwise healthy lizard (which I managed to catch and put outside). I find the casual reference to dead animals in your house very strange. Who are these people? Are you friends with Martha Stewart? Because I think all normal people have flies in their house. Lucky for our cats. I have a fly stuck halfway in and halfway out of one of the screens in my window. Dead, of course. Summer is coming…I’m going to have to actually open that window and finish off the guillotine process. Oh, I’m with you — if I have a fly or two in the house, I just consider it a free cat toy. But suddenly having a dozen giant flies appear with no explanation (I hadn’t left any doors or unscreened windows open) is pretty weird. I had some window-screen flies too. I managed to get all but one particularly stupid one out while they were still alive. Also, to be fair, all the “dead animal” comments came in response to me asking where all these flies came from all of a sudden. I always wonder how long those things live. We have some that I swear make it through the winter in our attic. Flies are crazy. One creepy thing I didn’t mention: all the flies looked identical, so I was beginning to suspect that there was a fly-cloning lab somewhere in my house. Maybe you have one of those in your attic. 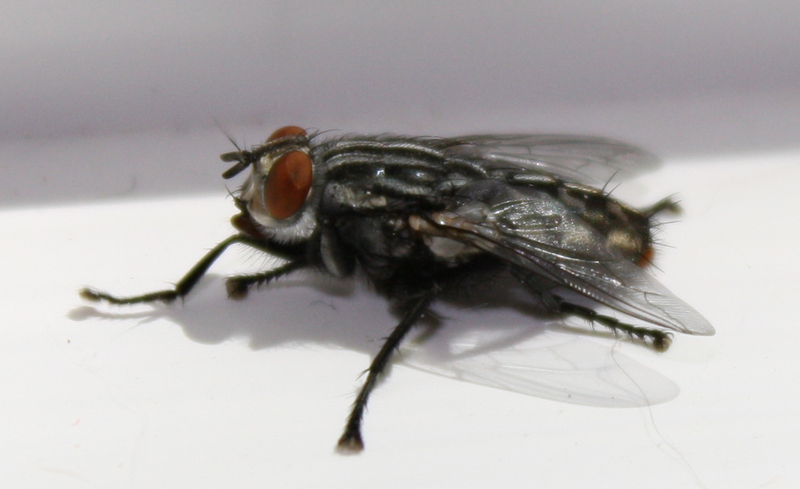 Wait…normally you can tell flies apart? Do you give them names? That’s normal. I do it, too, but only based on size–you know, the big ones I call “Tiny” and the big ones “Lil Buzzy” and stuff like that. Beyond size, all flies look the same to me. I know that’s terribly something-ist. You are too nice to those flies. If you don’t get tough with them right from the start they’ll fly all over you. You may be right — I asked a couple of them to wash the dishes Sunday night, and they just sat there and pretended they didn’t understand me. Nah, you don’t have a dead animal. If you open thy window, they will come. The creepy thing is that it at least 10 of them appeared to have materialized during the night, when all the doors and windows were closed. Ew! I’d rather use a flyswatter than a the sticky fly traps…there was an incident, when I was younger…getting tangled in one…EWWWW! Sorry — I hope you found your way out eventually. This is probably a different kind of trap. These are like a box, maybe 3 inches square and half an inch deep, cut in half into two skinny triangular boxes. Only the interior part of the trap is sticky (so the flies have to fly or walk inside them to get stuck — which, weirdly, they do). Sometimes you just get flies. We had ants recently. None of our neighbors said anything but I KNOW they think it’s because we have the dirtiest apartment in the hall. Now they’ve got them. And we don’t. HA HAAAAA. Maybe you should get a lizard, just in case they come back. You can never be too careful. I’ve come over here to visit after seeing your nearsightedness comment on Nursemyra’s blog. Myopia makes blog reading easy though, doesn’t it? I have bees in my house. No, I am not the person who Googled “MY SON KEEPS SEEING BEES BUT THERE IS NO BEES” and ended up on your blog. But I’ve learned a LOT about both flies AND bees now that I’ve met you. I hope you can convince your bees to relocate — unless you’re a beekeeper, in which case: isn’t it unusual to keep them in the house?